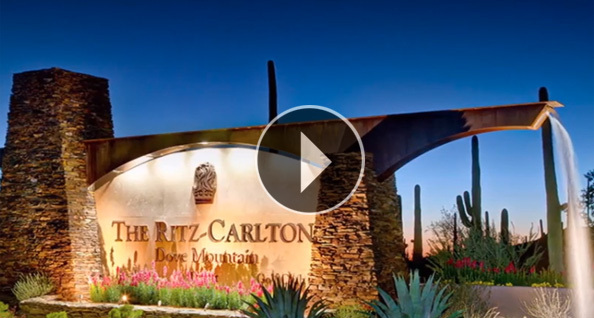 (MARANA, AZ) – July 6, 2011 It has been a momentous year for The Residences at The Ritz-Carlton, Dove Mountain. A total of 13 sales, totaling nearly $20 million, have closed in the last 6-months. Just last week, one of the three luxury models was purchased and the homebuyers plan to move in by mid-July. The newly purchased Desert Sonoran Castillo model features 4,725 square feet of living space, plus a 624 square foot casita, disappearing window walls in the living room and dining areas, a magnificent fire pit, an amazing pool with outdoor kitchen and views of the 6th green of the Wild Burro golf course, as well as top-of-the-line appliances. The community’s new residents, a couple living in Japan, credit their recent purchase to a recent stay at The Ritz-Carlton hotel which sparked an interest in making it more than just a vacation destination but their primary home destination. Once complete, the initial residential phase of The Residences at The Ritz-Carlton, Dove Mountain will have 110 highly-personalized homes featuring the finest in design and finishes, together with 16 custom estate homesites. New prices for the Amolillo single family homes start at $1.1 million; Seven Saguaros single family homes start at $1.5 million; and custom fairway homesites start at $590,000; villas start in the low $800,000s; and Rockpoint Ridge custom estate homesites start at $750,000. Visit The Residences for more information and incentives.